Last night the Dancing with Life KM group met, but we never got around to talking about the book. We sat for 20 minutes, as usual, and then went around the circle, giving everyone a chance to check in and to share what’s going on in their life. When it came to me, I started talking about the retreat I just came back from…about Mirabai..and people started asking questions, and then we got into how important it is to go on retreats, especially with a good teacher, and then about how to find one….and before we knew it, the time was up! So in keeping with the theme of finding a good teacher, I thought I’d post just one more thing about Mirabai. She’s got a new CD, called Working with Mindfulness, which can be downloaded here. It’s about practicing mindfulness at work and it has a series of short, guided meditations including: Email with Intention, Reminders for a Mindful Workplace and Building Better Work Relationships. Here’s what Mirabai says about the CD: You cannot control your stressors at work, but you can learn to manage your responses to them. 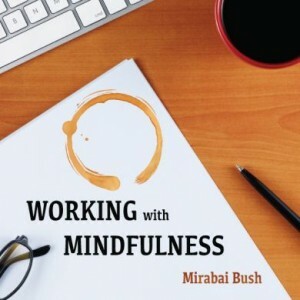 “Working with Mindfulness” offers exercises for the workplace adapted from traditional Buddhist practices that I’ve taught to hundreds of people at Google, Monsanto, Hearst, Seva Foundation, Fetzer Institute, and the Wilderness Society. Participants report reduced stress, increased productivity, and openness to creative problem solving. Most importantly, they felt that their relationships improved.